Last week, as part of Secretary Clinton’s Diaspora Forum, CGP held a panel discussion titled “Improving where you’re from, from where you are” . The panel, which included Jeremiah Norris (Senior Fellow at Hudson), Yulya Spantchak (Research Fellow at Hudson), and Barb Span (Vice President of Global Affairs at Western Union), discussed the value of remittances in development. Numerous evidence suggests that worker’s remittances by far exceed ODA to developing countries. In 2006, a report compiled by the Inter- American Development Bank (IDB) as well as the International Fund for Agricultural Development (IFAD) showed that approximately 150 million migrant workers sent over $300 billion to their home countries. A more recent study in 2010, the World Bank estimates that more than 215 million people live outside their countries of birth. 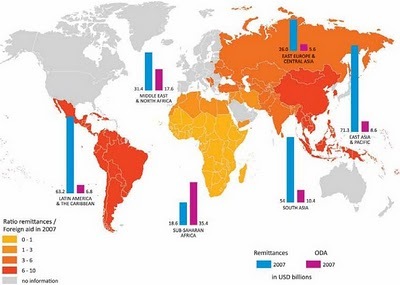 Remittances to developing countries are estimated to have reached $325 billion in 2010 and are three times the size of ODA (Figure below). Moreover, these figures are thought to be underestimates due to inexact measurements as a result of undocumented immigrants and informal ways/records of money transfer. The IFAD estimated that approximately a third of the money sent back to migrants’ home was sent to rural areas. While it was widely acknowledged that these remittances were used to purchase basic necessities and daily upkeep such as food, clothing and medication, the World Bank affirms that on a micro level remittances are no longer only used for basic necessities. Remittances are also used as a sustainable source in education, healthcare and investment towards a livelihood, due to the increase in overall household income. However, of the estimated 10-20% of remittances saved, the majority is done so via informal methods (e.g. hidden under a mattress, stored away in a cooking pot). As this money is not secured in a savings account by any formal institution where it may grow and properly be monitored, IFAD warns that the communities and families are unable to benefit from development and economic growth. “One of our priorities is to improve poor people’s options by finding ways to cut transaction costs and link remittances to other financial services, such as savings and investments and loans”. Taken from the World Bank, on a macroeconomic level, remittances are more stable than other sources of foreign exchange because “their variation is often countercyclical, helping sustain consumption and investment in downturns”. Remittances also “increase the level of foreign exchange receipts”, hence they are a reliable financial source for developing countries in spite of global financial crises. During the event, Yulya Spantchak talked about regional distributions of remittances from DAC donor countries to developing countries. Barb Span, from Western Union, gave a glimpse into the findings of a soon to be released report by Manuel Orozco on the impact of pooled remittances on business development in Mexico. The report analyzes the outcomes of the “Four plus One” program, in which the Mexican local government, country government, and Western Union each contribute a dollar to each dollar remitted to Mexico for diaspora driven initiatives. Some of these initiatives included small enterprise development which in turn have led to job creation. Given that studies have shown that remittances by far outstrip ODA to developing countries, it comes as a surprise that remittances are not considered in wider borders. If remittances are truly a tunnel to development then there must be ways to encourage and facilitate the transfer of money across international borders. As IFAD President noted, if more efficient methods of transferring money are developed, as well as linking these transfers with financial institutions, then conceivably we will see improved and developing economies in lower and middle income countries. Previous Article Food for 9.3 billion… 10.1billion?